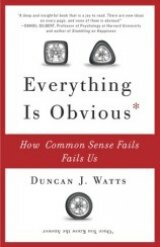 Why can't the social science universe be more like the physical world, asks sociologist and network science pioneer Duncan J. Watts in "Everything Is Obvious: How Common Sense Fails Us" (Crown Business trade paperback, 368 pages, appendix, bibliography, notes, index, $16.00). In an outstandingly readable book in a field infamous for books and articles laden with academic jargon, Watts explains why the "far messier" social world doesn't conform to the physical world's rules, and "the more we learn about it, the messier it is likely to seem." (Page 262). "The result is that we will probably never have a science of sociology that will resemble physics. And that's OK."
This answer probably won't satisfy social scientists -- if that isn't an oxymoron -- who have advanced cases of "physics envy," Watts writes. Since he is a trained physicist -- he has a Ph.D. in Theoretical and Applied Mechanics from Cornell University -- the Australian native should know what he's talking about. In addition to being a professor of sociology at Columbia University, he's a principal researcher at Microsoft Research and a founding member of MSR in New York City. "Everything Is Obvious" should be on the bookshelves of just about everybody, from journalists -- I can speak from decades of experience how we journalists often jump to erroneous conclusions based on "common sense" -- to business people to public relations people to advertising and marketing professionals, to just about everybody. Common sense ain't what it used to be! And it probably never was. "Since becoming a sociologist, I have frequently been asked by curious outsiders what sociology has to say about the world that an intelligent person couldn’t have figured out on their own. It’s a reasonable question, but as the sociologist Paul Lazarsfeld pointed out nearly sixty years ago, it also reveals a common misconception about the nature of social science. Lazarsfeld was writing about "The American Soldier", a then-recently published study of more than 600,000 servicemen that had been conducted by the research branch of the war department during and immediately after the Second World War. "To make his point, Lazarsfeld listed six findings from the study that he claimed were representative of the report. For example, number two was that 'Men from rural backgrounds were usually in better spirits during their Army life than soldiers from city backgrounds.' 'Aha,' says Lazarsfeld’s imagined reader, 'that makes perfect sense. Rural men in the 1940s were accustomed to harsher living standards and more physical labor than city men, so naturally they had an easier time adjusting. Why did we need such a vast and expensive study to tell me what I could have figured out on my own? Watts goes on to say that while Lazarsfeld was talking about social science, "I will argue in this book is that his point is equally relevant to any activity— whether politics, business, marketing, philanthropy— that involves understanding, predicting, changing, or responding to the behavior of people. Politicians trying to decide how to deal with urban poverty already feel that they have a pretty good idea why people are poor. Marketers planning an advertising campaign already feel that they have a decent sense of what consumers want and how to make them want more of it. And policy makers designing new schemes to drive down healthcare costs or to improve teaching quality in public schools or to reduce smoking or to improve energy conservation already feel that they can do a reasonable job of getting the incentives right. Typically people in these positions do not expect to get everything right all the time. But they also feel that the problems they are contemplating are mostly within their ability to solve—that “it’s not rocket science,” as it were. Well, I’m no rocket scientist, and I have immense respect for the people who can land a machine the size of a small car on another planet. But the sad fact is that we’re actually much better at planning the flight path of an interplanetary rocket than we are at managing the economy, merging two corporations, or even predicting how many copies of a book will sell." If you don't know what the "Halo Effect" is or what the "Matthew Effect" is, Watts tells us in very readable prose. If you think "readable prose" is the normal state of affairs, you haven't read a sociology textbook or sociological study recently! In their efforts to overcome "physics envy," many writers on the subject serve up statistics like food at an all-you-can-eat restaurant, making the subject even more complicated. The "Halo Effect", Watts says, as used by management scientist Phil Rosenzweig "refers to our our tendency to extend our evaluation about one particular feature of another person -- say that they're tall or good-looking -- to judgments about other features, like their intelligence or character, that aren't necessarily related to the first feature at all. Just because somebody is good-looking doesn't mean they're smart...but subjects in laboratory experiments consistently evaluate good-looking people as smarter than unattractive people...." Boy, we're even more shallow than I suspected! The "Matthew Effect" was a coinage of sociologist Robert Merton, positing that success early on in an individual's career "confers upon them certain structural advantages that make subsequent successes much more likely, regardless of their intrinsic aptitude." The name comes from the verse in the Bible's Book of Matthew: "For to all those who have, more will be given, and they will have an abundance; but from those who have nothing, even what they have will be taken away." Watts notes that Matthew was speaking of wealth, hence the phrase "the rich get richer and the poor get poorer" (or, as my late mother said: "the poor get children!"). >Why did Facebook succeed when other social networking sites failed? > How much can CEOs impact the performance of their companies? > Does higher pay incentivize people to work hard? It seems obvious, for example, that people respond to incentives; yet policy makers and managers alike frequently fail to anticipate how people will respond to the incentives they create. Social trends often seem to have been driven by certain influential people; yet marketers have been unable to identify these “influencers” in advance. And although successful products or companies always seem in retrospect to have succeeded because of their unique qualities, predicting the qualities of the next hit product or hot company is notoriously difficult even for experienced professionals. Only by understanding how and when common sense fails, Watts argues, can we improve how we plan for the future, as well as understand the present—an argument that has important implications in politics, business, and marketing, as well as in science and everyday life.